Losing teeth can impact your overall appearance, self-esteem, and even your confidence when talking and laughing. Advanced Dental Arts in Wesley Chapel understands that this can be a traumatic thing to experience, which is why we dedicate ourselves to help reconstruct smiles through restorative and cosmetic dentistry procedures. 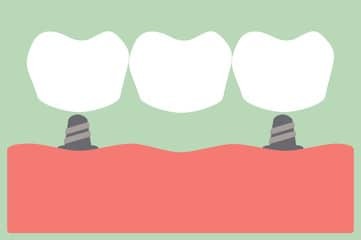 One of our most popular procedures is a dental bridge, which can eliminate those spaces and help fill in missing teeth. Over time, loss of teeth can negatively impact your dental health in a number of ways. In severe cases, missing teeth can even lead to gum disease or temporomandibular joint (TMJ) disorder. A bridge, combined with other restorative techniques, such as a crown or a dental implant, can help bring your smile back to its original radiance as well as correct any issues you may have developed with your bite. A dental bridge in Wesley Chapel can be used to fill in the space created by missing teeth. The bridge acts as a foundation upon which crowns are secured. They span the empty space in your mouth and are permanently attached by way of the surrounding teeth or implants. 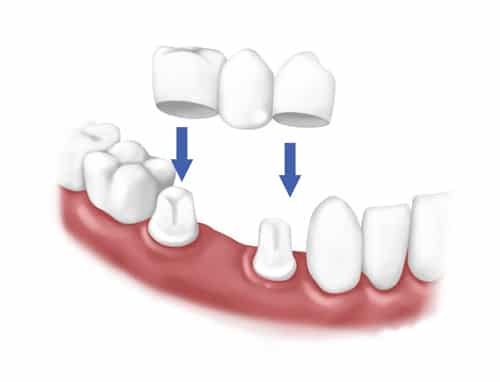 These anchor teeth are known as abutments and are cemented to the bridge to help ensure that it stays in place. A replacement tooth, known as a pontic, is then fitted to the bridge before it is covered with the crown chosen by you and Dr. Susana Kulangara. Like crowns and implants, there are a number of dental bridge materials available to choose from. Advanced Dental Arts will work with you to help pick a material that fits your needs, personal preference, and budget. Bridges are a great alternative to implants or dentures and can last a lifetime if properly cared for. A missing tooth can be extremely detrimental to your overall oral health. As time elapses, one or more missing teeth can impact your jaw structure, causing your teeth to shift and your gums to weaken. Your bite can be negatively affected, which will make everyday activities such as eating and talking uncomfortable or unnecessarily difficult. In addition, it can affect your facial structure and appearance, causing the face to droop making you appear older. Dr. Susana Kulangara finds that teeth that have shifted out of place can also be harder to clean, leading to plaque and tartar build up in between your teeth and gums. All in all, while it may not seem like a very big deal, it is important to remember that missing teeth are a serious dental health case issue that can easily be avoided with proper care. Advanced Dental Arts is dedicated to helping patients regain and maintain optimum dental health.